Kudos to the VFX team of The Flash for bringing this episode to life. The highly-anticipated showdown between Gorilla Grodd (voiced by David Sobolov) and King Shark (voiced by David Hayter) only disappointed in its brevity. 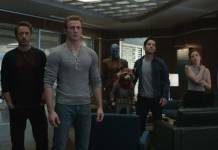 Their brief battle takes place near the end of the episode – with the rest of the night dedicated to the moral dilemma of to cure or not to cure metahumans and the welcome return of Joe West (Jesse L. Martin) to The Flash fold. The episode starts out with Cisco (Carlos Valdes) announcing that the cure for metahumans is ready. Caitlin (Danielle Panabaker) explains that all they need is a metahuman to volunteer for the human trial. Unfortunately, thanks to Cicada, most of the metahumans in Central City are gone or in hiding and the team discusses going to another Earth for a trial subject. Barry realizes they won’t have to go to that extreme. A.R.G.U.S. has a meta in custody: King Shark from Earth 2, who was brought to Earth 1 by Zoom to kill the Flash. Barry, Cisco, and Caitlin meet up with Lyla Michaels (Audrey Marie Anderson) at the A.R.G.U.S. facility where King Shark is being held. They explain to Lyla that they have a cure for metahumans, which I still think is a bad idea. Such a cure could be weaponized, and telling A.R.G.U.S. could be a mistake. We shall see if that is a storyline that will pop up in the future or if it’s just me being cynical. 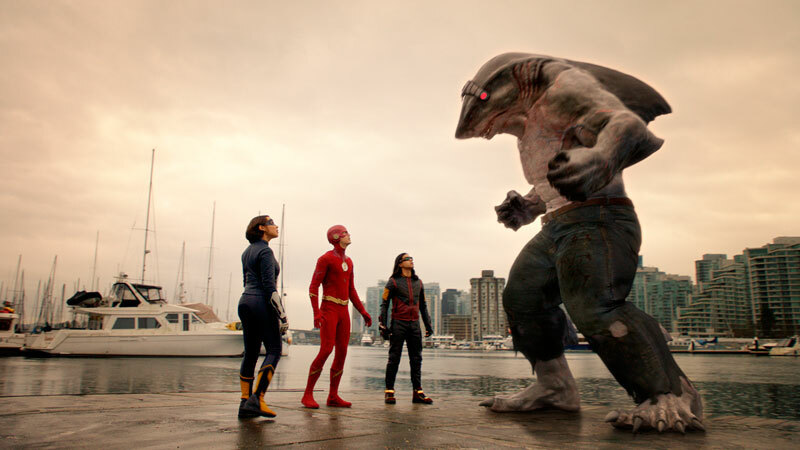 At the pier where King Shark is being held, they find Earth 1’s Doctor Tanya Lamden (guest star Zibby Allen), who is also the widow of Earth 1’s Shay Lamden. On Earth 2, Shay had been transformed into King Shark. Tanya has been working with her dead husband’s doppelganger, communicating with him through a telepathic crown devise, and curbing his violent tendencies. She summons King Shark with the intent of asking him to take the cure voluntarily. Unfortunately for all of them, King Shark becomes violent, and grabs Cisco. Looking like he is about to bite Cisco’s head off, Barry speeds in and injects him with the cure. King Shark falls into the water and comes out a man. The cure works! Sort of. Back at S.T.A.R. Labs, Caitlin explains that there is still a bit of dark matter in Shay’s brain, but a second dose will clear that right up. But first, Cisco and Caitlin need to confront Barry about using the cure on King Shark before he gave his consent. Cisco points out that forcing someone to do one’s bidding is not what heroes do; Barry counters that had he not injected the shark, Cisco would be dead. It seems that Barry is indeed walking the fine line between doing what’s right, and doing what needs to be done by whatever means necessary. It could be lingering shades of Oliver Queen in Barry’s DNA after the whole Elseworlds adventure or it could just be a sign of Barry’s desperation to stop Cicada. However, the team cannot figure out why the telepathic crown, which seems to be working properly, malfunctioned. Barry, Caitlin, and Cisco are pondering this dilemma when Cisco suddenly becomes violent and attacks Barry with his Vibe powers. Barry speeds Cisco into a cell in the pipeline and goes back for Caitlin who is not alone. 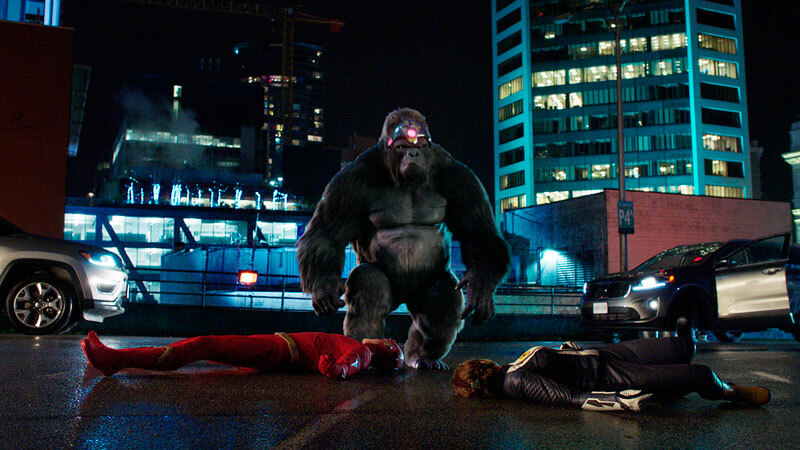 Gorilla Grodd, who escaped from A.R.G.U.S., is standing right next to her, using his mind control to force Frost to attack Barry. Grodd escapes, taking the telepathic crown with him. It was Grodd who forced King Shark to become violent, not a fault in the crown. 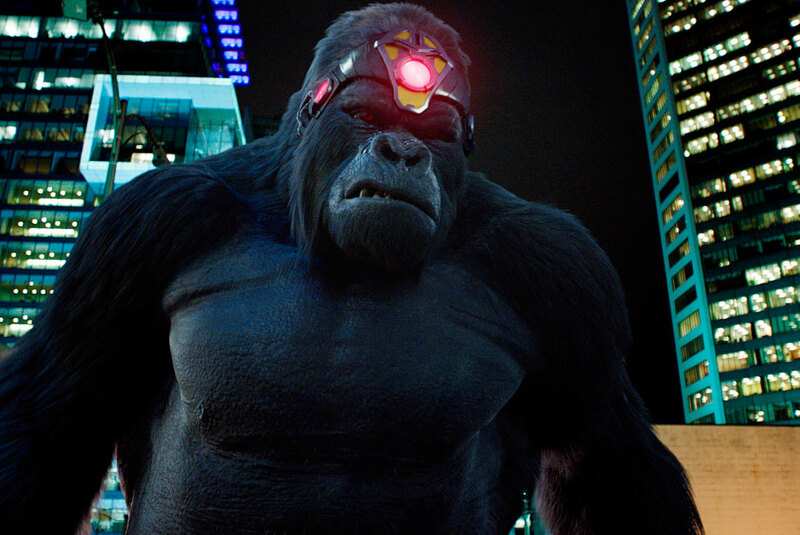 Grodd wants to use the Crown to enhance his telepathic powers and control the minds of everyone in the city. 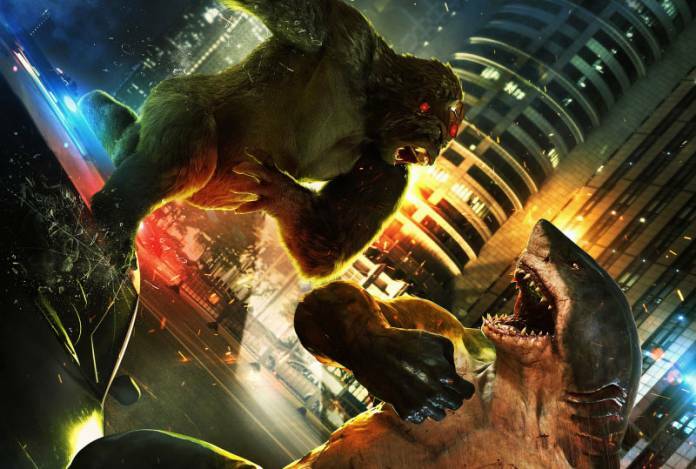 Since he still has some animal-like qualities in his brain, Shay suggests that they turn him back into King Shark to fight Grodd. The team explains that if they turn him back into King Shark, he will never be human again, but Shay is willing to do that in order to atone for the people he hurt as King Shark and to protect Tanya, who he has fallen in love with. Cisco again uses his Vibe powers to change Shay back into King Shark, and Barry and Nora race off to slow Grodd down. Barry and Nora are not much help though, and the battle between Gorilla Grodd and King Shark is on. There were lots of things thrown (like cars), lots of scaffold climbing, and scaffolds falling, but Grodd seems to win the battle. He climbs up on a crane, dragging the body of King Shark with him. Caitlin and Barry remember something about sharks and electrical impulses, and Tanya says that electricity might jolt King Shark back to his feet. The electricity is easily provided by Barry and Nora, and King Shark wins the day, taking the telepathic device back from Grodd. Caitlin suggests putting Grodd into a medically-induced coma while in A.R.G.U.S. custody to stop his telepathic abilities. King Shark is put back into an A.R.G.U.S. tank, and is watched over by Tanya, who admits to Sherloque that she is in love with him despite him now being a shark. It had the feel of The Shape of Water, especially when Killer Shark swam up and he and Tanya touched hands through the glass. As Sherloque explains, the heart wants what the heart wants, but…. ew. Elsewhere in the episode: Joe is back! He has been spending time with Iris, catching her up on his trip to Tibet to visit Wally and recover from his episode with Cicada. And he is still great at offering fatherly advice; noticing that Iris is hesitant to talk about team Flash and not going to her shiny new newspaper office. He attempts to help Iris find her courage and get her strength back with a boxing session – which seems to work. Iris goes back to her office and gets a text about the Gorilla Grodd vs. King Shark battle. Not a good start for a fledgling newspaper – missing the battle of the century taking place in their hometown. She is going to have to step it up for the Central City Citizen to become a success! At the end of the episode, Barry checks in with Cisco and Caitlin to see if they are all good. He apologizes for the way he acted previously and suggests that they offer the cure to Cicada. So, Team Flash is back to bad ideas. Why would Cicada, who has vowed to rid the world of metas, take the cure before he has done what he set out to do? I ended the episode shaking my head. Let us know what you think in the comments and check out a preview for next week below. Next articleMaleficent: Mistress of Evil Poster and Release Date Revealed!